ABOVE: A Franzbrötchen baker's bag and the treasure within. 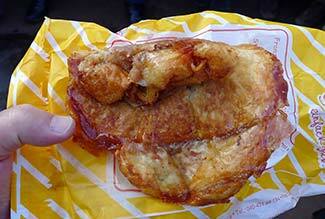 One of Hamburg's culinary treats is the Franzbrötchen, a sweet roll made with Hamburg's version of Danish pastry dough. According to legend, Napoleon's troops introduced croissants to Hamburg during the French occupation of the city from 1806 to 1814. The local bakers and their German customers preferred a sweeter product, so the bakers doused their heavier version of croissant dough with a mixture of butter and sugar, added cinnamon (and occasionally raisins), and let the ersatz croissants carmelize in the oven. 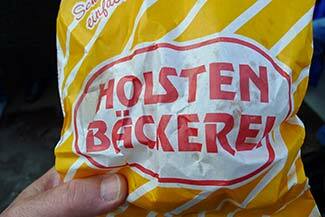 Nearly 200 years later, the rolls which became known as Franzbrötchen are still a staple of Hamburg bakeries, although they're virtually unknown in other parts of Germany. Be sure to try at least one during your visit to Hamburg--preferably on an empty stomach, and with a cup of coffee close at hand. Manfred Beseler's site is packed with information about the Franzbrötchen, baking competitions, and more. The text is in German, but you can read an oddly-formatted Google translation here.